Compare prices and find affordable car hire in New York Airport. We search among multiple suppliers to find the cheapest prices. Unlimited mileage, the necessary insurance and tax are included in the rate given. The John F. Kennedy International Airport (JKF) is an international airport located in the New York borough of Queens. It is located only 12 miles of Lower Manhattan. This New York Airport is commonly referred to by its IATA code – JFK. It is the busiest international passenger gateway in the United States. It handles more international traffic than any other airport throughout North America. In 2010, the airport handled an approximate 46,514,154 passengers. This also makes it the fourteenth busiest airport in the entire world. When combined with LaGuardia Airport and Newark Liberty Airport, it makes New York City the second busiest airport system in a city, right after London, United Kingdom. 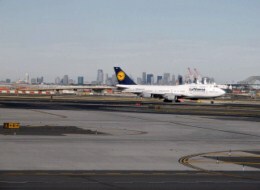 More than ninety airlines operate out of the JFK Airport. It is the operational base for JetBlue Airways and a major international gateway hub for Delta Airlines and American Airlines. Other airlines include Air France, Alitalia, British Airways, El Al, Iberia, KLM, Lufthansa, Qantas, and US Airways. The top five busiest international routes in 2010 were London, United Kingdom; Paris, France; Frankfurt, Germany; Santo Domingo, Dominican Republic; and Tokyo, Japan. The top five busiest domestic routes were Los Angeles and San Francisco, California; and Orlando, Miami, and Fort Lauderdale, Florida. Once inside the New York JFK Airport, there are quite a few amenities that travelers may be interested in. These amenities include tourist information, car rental kiosks, shopping boutiques and restaurants, and ATM machines to withdraw money for the trip.